...so also Hannah will always be a Bodmer to me. To me it's just P75. I'm looking forward to new images! Manuscripts have different contexts. In the context of the list of NT papyri, P75 is pretty clear and helpful. In the context of the purchase (and I would think the background provenance), then Bodmer is clear and helpful (although I have never been completely happy with XIV-XV for a single codex). In its new context it has a new name. 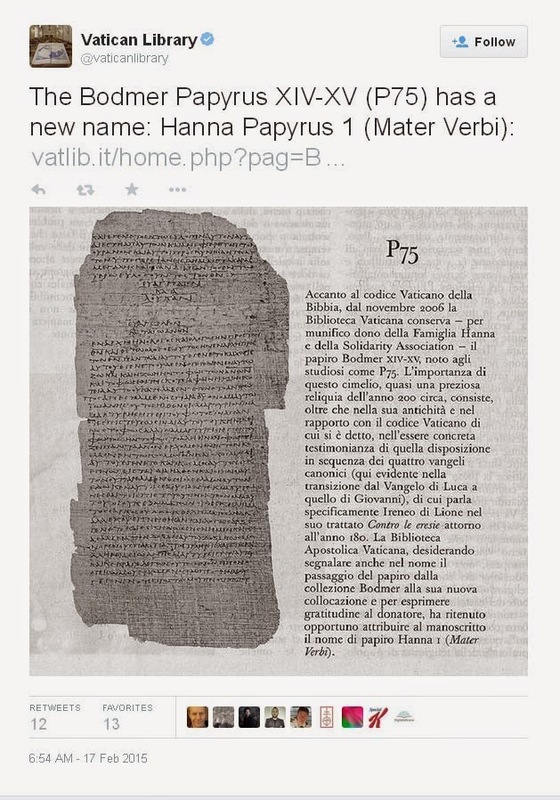 According to this page, its new name is "Mater Verbi Papyrus," which leads me to suspect that "Hanna 1" is its shelf mark rather than part of its name, despite what the tweet claims.